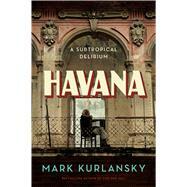 Award-winning author Mark Kurlansky presents an insider's view of Havana: the elegant, tattered city he has come to know over more than thirty years. Part cultural history, part travelogue, with recipes, historic engravings, photographs, and Kurlansky's own pen-and-ink drawings throughout, Havana celebrates the city's singular music, literature, baseball, and food; its five centuries of outstanding, neglected architecture; and its extraordinary blend of cultures. Like all great cities, Havana has a rich history that informs the vibrant place it is today--from the native Taino to Columbus's landing, from Cuba's status as a U.S. protectorate to Batista's dictatorship and Castro's revolution, from Soviet presence to the welcoming of capitalist tourism. Havana is a place of extremes: a beautifully restored colonial city whose cobblestone streets pass through areas that have not been painted or repaired since the revolution. Kurlansky shows Havana through the eyes of Cuban writers, such as Alejo Carpentier and José Martí, and foreigners, including Graham Greene and Hemingway. He introduces us to Cuban baseball and its highly opinionated fans; the city's music scene, alive with the rhythm of Son; its culinary legacy. Once the only country Americans couldn't visit, Cuba is now opening to us, as is Havana, not only by plane or boat but also through Mark Kurlansky's multilayered and electrifying portrait of the long-elusive city. Mark Kurlansky is the New York Times bestselling author of Cod, Salt, The Basque History of the World, 1968, The Big Oyster, and International Night, among many others. He received the Dayton Literary Peace Prize for Nonviolence, Bon Appetit's Food Writer of the Year Award, the James Beard Award and the Glenfiddich Award. Salt was a Los Angeles Times Book Prize finalist. He spent ten years as Caribbean correspondent for the Chicago Tribune. He lives in New York City. www.markkurlansky.com.